Supermarket chain NTUC FairPrice on Wednesday (Mar 28) officially launched its revamped e-commerce platforms, which have been renamed FairPrice On. 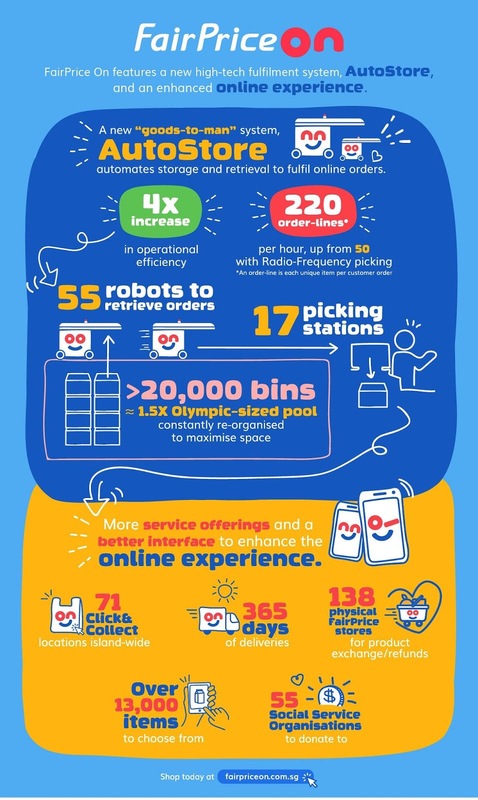 FairPrice said AutoStore is able to handle up to 3,000 orders per day and is four times faster than its old method of retrieving products manually. FairPrice On also offers subscribers the option of donating to the less fortunate. Through a partnership with the National Council of Social Service, FairPrice On subscribers are able to choose from a list of 55 Social Service Organisations, such as Thye Hua Kwan Family Centres and Food from the Heart. Subscribers can then donate the required groceries directly to the beneficiaries. Delivery fees are waived for donated groceries, said FairPrice.